THIS IS A VINTAGE "BLENKO" VASE. GREEN GLASS TRIMMED IN (COBALT) BLUE ON TOP AND BASE. PERFECT CONDITION, NO CRACKS OR CHIPS, NO REPAIRS. LOOKS HANDMADE, BEAUTIFUL UNIQUE DESIGN. PLEASE VIEW ALL PICTURES AND CONTACT ME IF YOU HAVE ANY QUESTIONS. 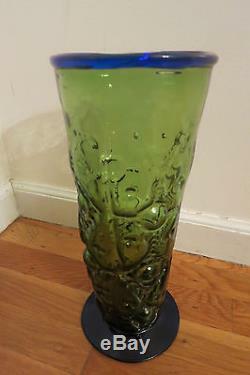 The item "VINTAGE BLENKO GLASS VASE STUNNING GREEN/BLUE LARGE VASE 13 TALL" is in sale since Wednesday, August 31, 2016. This item is in the category "Pottery & Glass\Glass\Art Glass\North American\Blenko". The seller is "allinone8645" and is located in Monroe, New York. This item can be shipped to United States, Canada, United Kingdom, Denmark, Romania, Slovakia, Bulgaria, Czech republic, Finland, Hungary, Latvia, Lithuania, Malta, Estonia, Australia, Greece, Portugal, Cyprus, Slovenia, Japan, China, Sweden, South Korea, Indonesia, Taiwan, South africa, Thailand, Belgium, France, Hong Kong, Ireland, Netherlands, Poland, Spain, Italy, Germany, Austria, Israel, Mexico, New Zealand, Singapore, Switzerland, Norway, Saudi arabia, Ukraine, United arab emirates, Qatar, Kuwait, Bahrain, Croatia, Malaysia, Brazil, Chile, Colombia, Costa rica, Panama, Trinidad and tobago, Guatemala, Honduras, Jamaica, Barbados, Bangladesh, Bermuda, Brunei darussalam, Bolivia, Ecuador, Egypt, French guiana, Guernsey, Gibraltar, Guadeloupe, Iceland, Jersey, Jordan, Cambodia, Cayman islands, Liechtenstein, Sri lanka, Luxembourg, Monaco, Macao, Martinique, Maldives, Nicaragua, Oman, Peru, Pakistan, Paraguay, Reunion, Bahamas, Viet nam.